In 1936, English mathematician Alan Turing invented an imaginary computing machine to help him solve a problem in mathematical logic. 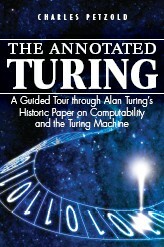 From these humble beginnings, the Turing Machine has become an essential tool in understanding computation and so much more. In a discussion largely free of mathematics and technical issues, Charles Petzold — author of the recent book The Annotated Turing — traces the history of this odd mathematical tool: from its original conception in 1936, to its starring role in the cybernetics movement of the 1940s and 1950s, to its application by philosophers, neurologists, physicists and cosmologists in everything from understanding human consciousness to grappling with the information-saturated universe in which we live. In our post-Turing world, everything is a Turing Machine. Charles Petzold is the author of Code: The Hidden Language of Computer Hardware and Software (Microsoft Press, 1999), The Annotated Turing: A Guided Tour through Alan Turing's Historic Paper on Computability and the Turing Machine (Wiley, 2008), and several best-selling books on computer programming.